It’s no secret that I love coffee and my days are fueled by coffee more than ever lately. Iced Nana Lattes are one of my favorites to enjoy before barre or working out but I’ve been enjoying them more at other times too. With everything going on lately, not as planned, I feel like my tank is running off nothing but coffee and my tummy, and body, hasn’t been loving it so instead of my daily Americanos and espresso I’ve been making more lattes, these Iced Nana Lattes with cold brew (less acidic). I can’t tell you how many times and ways I’ve enjoyed this Iced Nana Latte switching up milks, add-ins, ect. 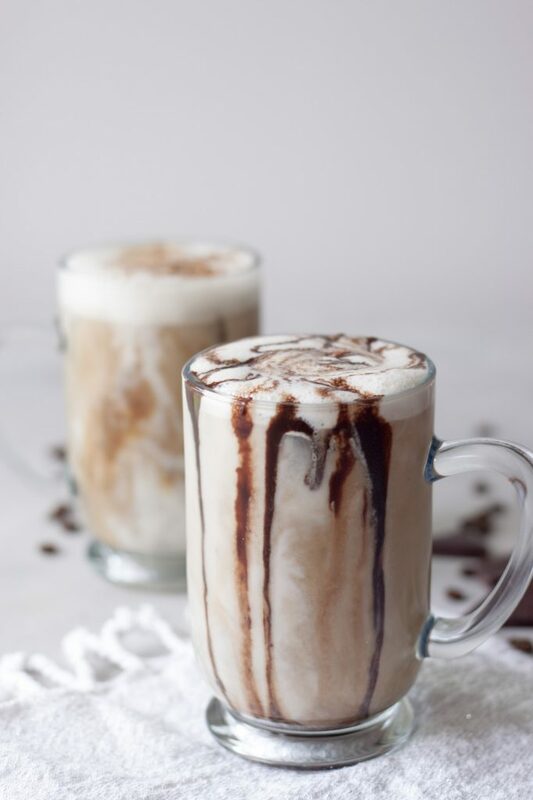 While I love chocolate vanilla lattes are usually more my thing but I did whip up an Iced Nana Mocha for my husband and I do enjoy one on occasion to mix things up. I’ve posted Iced Nana Lattes countless times on Instagram Stories and after being asked for the recipe, and posting lots of recipes on there I decided it was time for a post. As I said there are a number of variations and I’ll try to get them all noted but it’s kind of like all the bullet proof coffee craze where everyone has their favorite version. I also vary it depending on what I have on hand and my needs. If I’m doing a longer workout I might add a little coconut oil or maca, if it’s in the afternoon as a pick me up maybe adding in a little collagen, reshi, or ashwagandha. Time of day I’ll vary the adaptogens I might add. Needing more protein I might make it with a protein milk like Ripple, or depending on what I have on hand and my mood I’ll use almond or coconut milk. 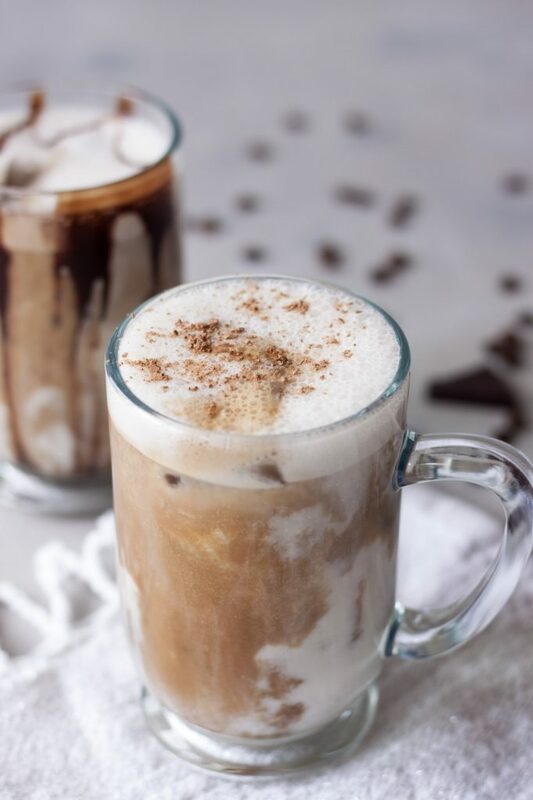 For just a treat I may go with a Nana Nitro Cold Brew Version, using a thick and rich homemade milk, cold-pressed, or Toasted Coconut Coconut Almond Milk! Yes if you’re keeping up the options are endless! I would say deciding is usually the hardest thing but it really isn’t as I usually know what my body needs and what I want at the time. You may be thinking what coffee and bananas? Yes a little crazy but not really and not only does it give me energy for those early morning workouts but my tummy also handles it better than just grabbing coffee. Layering it makes it pretty and doesn’t really take extra time but if you’re in a hurry you can just blend it all together too instead of pouring your espresso or cold brew over top. 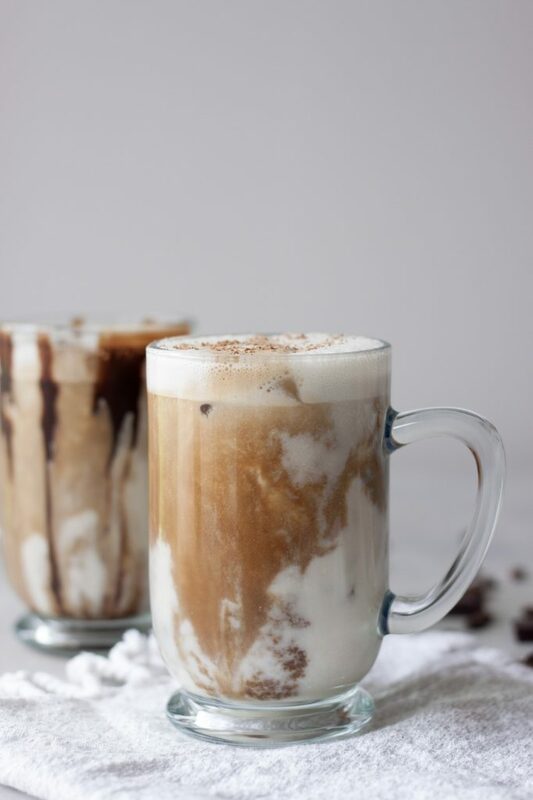 Delicious Iced Nana Latte, or Mocha, is a creamy blend of banana and non dairy milk topped with espresso or cold brew for the ultimate treat. Great for pre-workout or an afternoon pick me up, adaptogen and sueprfood add-in options, and endless variations. Fill a glass 2/3 with ice and pour banana milk mixture over the ice. Pour espresso or cold brew over top. Sprinkle with cacao or cinnamon if desired. Enjoy! I have used a variety of non dairy milks liking the thicker coconut milks and almond milks best such as homemade, Juice So Good cold-pressed Cashew Milk, New Barn Barista Milk, MALK, or for added protein Ripple. I have also used and like So Delicious Coconut Milk and Calfia Farms Toasted Coconut Coconut Almond Milk and when available Calfia Horchata. To make an Iced Nana Mocha add 2 tablespoons of chocolate sauce/syrup. To make a Iced Nana Nitro Cold Brew use 1/2 a frozen banana and pour Nitro Cold Brew (I like Calfia Farms) over top. For a little extra something add a pinch of cinnamon and or cacao. Additional add-ins: gelatinized maca, reshi, ashwagandha, collagen (Vital Proteins), coconut or MCT oil. Oh my goodness, this sounds AMAZING! What a great idea! Definitely going to try this soon! Thank you, love to hear what you think when you do! This looks so good! I LOVE that you can change your quantity in your recipe and it change how much of each ingredient you need! That is so helpful!! Thank you, it’s a new plug in I just started using. OHHHH yes please!! I love this twist on the nice cream that everyone has posted, this sounds much more my speed! More of a coffee and smoothie combo but I love it pre-workout or in the afternoon! This sounds SO interesting! I am fueled by coffee, but I usually take mine black with just a touch of coconut cream! This sounds so unique! Right there with you, usually it’s an Americano or espresso and when I do something a latte but this has been better on my tummy and great pre workout lately. Coffee is everything to me. I’ve added it to smoothies so this seems like another new fave for me! Oh I’m right there with you! You know I’m totally in love with this! Hoping to try it this weekend!! Yes and thank you for posting on Instagram this weekend! I would of never thought to add a banana! What a fantastic idea. Adds creaminess and is working great for me pre-workout lately with the early morning workouts. This is genius! Love the banana in this latte! Looks so creamy and delicious! Can’t wait to try this!